Woods is 4-under for the tournament, seven strokes behind leader Webb Simpson. 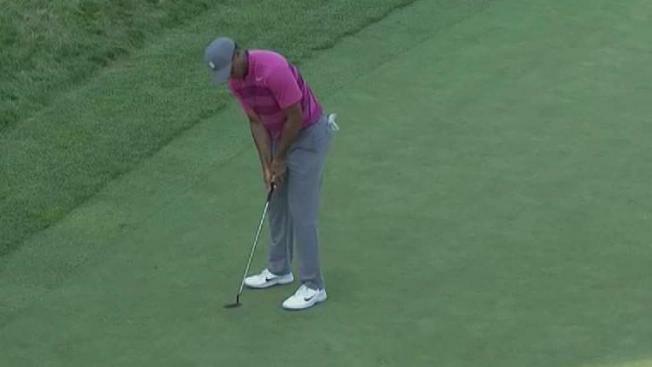 Tiger Woods is seven strokes back of the leader, Webb Simpson, after two rounds of the Dell Technologies Championship. Woods shot a 5-under 66 on Saturday, a stark improvement from his 1-over 72 on Friday, but it paled in comparison with Simpson's round. The 33-year-old Simpson shot an 8-under 63 on Saturday, complete with six birdies and one eagle. Simpson sits at 11-under through 36 holes, one stroke ahead of Tyrrell Hatton and Justin Rose. Woods is at 4-under, tied for 21st. Simpson has five career wins on the PGA Tour, including The Players Championship in March. He won at TPC Boston in 2011, shooting a 15-under for the tournament. He owns one career major title, back in 2012 at the US Open. The third round of the tournament continues on Sunday. Woods will tee off at 11:35 a.m., paired with Bryson DeChambeau. Heading into the weekend, DeChambeau led the FedEx Cup -- the PGA's playoff system -- in points. Simpson will be paired with Hatton and tee off last at 1:35 p.m. Rose and Tommy Fleetwood, who sits at 8-under par, go off at 1:25 p.m. Some other notable tee times for Sunday include Rory McIlroy (-4) at 11:25 a.m.; Jordan Spieth (-6) at 12:35 p.m.; Phil Mickelson (+2) at 7:45 a.m.; and Woodstock, Vermont native Keegan Bradley (-6) at 12:45 p.m. The cut line for the tournament wound up being 2-over par. Twenty-one golfers missed the cut in all. NBC10 Boston will have live coverage of the golf tournament at 3 p.m.